I am an admitted book hoarder and hopefully will pass on this wonderful love of reading to all my children. I strive to read everyday! My children see me reading, book shopping, logging in or researching books, doing a book review or recommending books on the DAILY! They can't get away from me and my addiction..err, habit. My youngest just turned 4 years old and she has already become the boss of..."Read one more, Momma!" This I hear 3 to 4 times a day. Usually, when "Mr. Sun" is sleeping and my coffee has worn off for the day! It has become a night time ritual. And while...honestly, there are times, I just want to read my OWN book or try to let her "read" independently...I usually end up reading to her, the same book...again! I love that this is "our time". I could sit and read to her for hours, if we had all that free time. I love that she would allow me to and she enjoys it. I see her remembering what happens next and asking questions when she doesn't understand something in the story. She has even begun reading along or "spoiling" the next page by reading ahead because she is remembering the story! It is so amazing watching her go through this process of learning. I can sit in awe of this accomplishment! These important times are the beginning steps in her learning to read,...and enjoy reading! I have learned it is so much easier to get her interested if I let her choose the book and also let her pick out what she likes at the library or bookstore. It doesn't always have to be "kiddy books". Non-fiction, science, nature, animals, transportation, even cookbooks with pictures....all these subjects have a book that will intrigue a child if they are interested. I wanted to try to make some lists and also help organize her books to be ready for homeschool/preschool. So, My first list is of books about school. 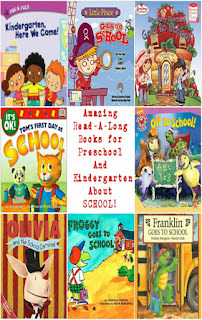 Do you need #books to help your #child get ready for #backtoschool or starting school. We seem to be moving backwards in working on "Back to School" in week #2, but that is okay. It's still September and she is enjoying the books. Well, and that seemed to be a subject we found a lot of books about. Some we have read, some I had read years ago to my older girls, and some I found online or on other great lists. 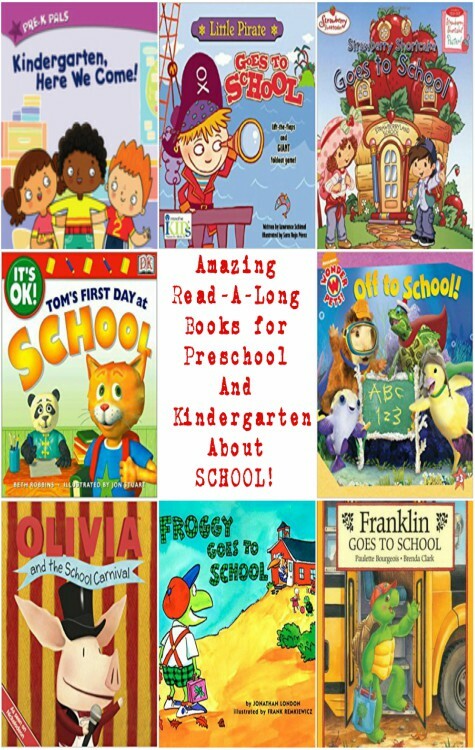 I hope you will find these books to read and enjoy with your littles! Please comment on any you have found or any you would like added to the list! I know there are SO many more wonderful books out there! So good that your love of stories is passing onto your little. A favourite of Monkey's at the moment is Room on the Broom by Julia Donaldson. One of mine too! "The witch tapped the broomstick and whoosh!they were gone." That's awesome! We love Room on the Broom! It is so cute and keeps you going!